Back in the early 2000s one company ruled when it came to getting attention. 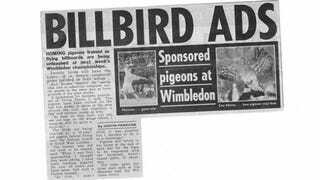 From pigeons trained to ruin Wimbledon to people paid to change their names to Turok, Acclaim was the king of press-baiting PR. It’s likely you’ve heard mention of some of Acclaim’s more famous campaigns. Talk of putting game adverts on gravestones, paying for people’s speeding tickets, or legal name changes to promote video games regularly top list features about crazy PR stunts. But here’s the thing: ten years on, those ‘bad’ ideas are still talked about, and if anyone remembers 2002’s Shadow Man 2, it’s not because they played it. Other ideas were clearly just ridiculous PR stunts. Like the offer of cash and games to anyone willing to change their name to Turok (to celebrate the release of the fourth game in the series, Evolution). That drew a surprising amount of global attention. “Five people actually did do it and change their name by deed poll,” claims Andrew. For all the scorn and frowning, there’s no argument that it worked. The campaigns are still remembered and everyone I spoke to (not all of whom wanted to go on record) remembered the time fondly. It’s a different world these days, however. Ten-ish years isn’t a long time in the grand scheme of things, but a lot has changed. “In those days it was all about the forums and it was amazing to light the touch paper and stand back. Acclaim was the publisher you loved to hate. The way the media’s evolved, if we were doing some of the stunts we did then, now, they would erupt in a whole new scale with social media,” thinks Andrew. “With social media, the difference now, is that a story would spread much faster but it would also take on a life of its own a lot faster as people commented on it. It doesn’t take a lot to outrage someone on Twitter. You would have to think through the various routes a story could go even harder than you did then”. Perhaps one of the most amazing parts of the story is the window within which it all happened. Most of Acclaim’s most memorable campaigns happened in a single year: 2002. “From my memory of it, in those days, publishers were releasing a lot more titles. It was like DVD launches: we were doing a game launch every month,” explains Andrew, partly explaining the need to create stunts that stood out. “The thing I always remembered about all of them is the usual gaming forums absolutely hated what we did, and we’d have hundreds of comments about it – until the penny dropped and people realised that they were giving us the attention we wanted by discussing it,” says Turok.